Currupted dll files in Windows? Not anymore with using simple little free tool called SFC. If application won’t open, Windows are running strangely or Java alerts about dll errors and not working smoothly, the SFC tool is here to this solve the trouble. Despite the increasing number of installed new Windows 7, in companies, especially larger ones are still the Windows XP majority. Over time, installed Windows have a good number of applications and also been removed a lot of them, it is easier could easily happen to us what the system dll corrupt. Then use a good old and simple tool to check your Windows system files (DLL). All programs likes very much to write and repairing the existing dll files in the folder c: \ windows \ system32 (including viruses who likes to hide in there). Surely sometimes happens to you, that you get an error not finding a certain dll file? What did you do? I use SFC tool. Application doesn’t want to open? I use SFC tool. It is true that there are a bunch of free programs to deal with, but prior to their installation we can use SFC tool, which we already have in Windows. SFC stand by for System File Checker and it’s job is to safely corrects faulty and corrupted dll files that are necessary for the proper functioning of the Windows system and installed applications. 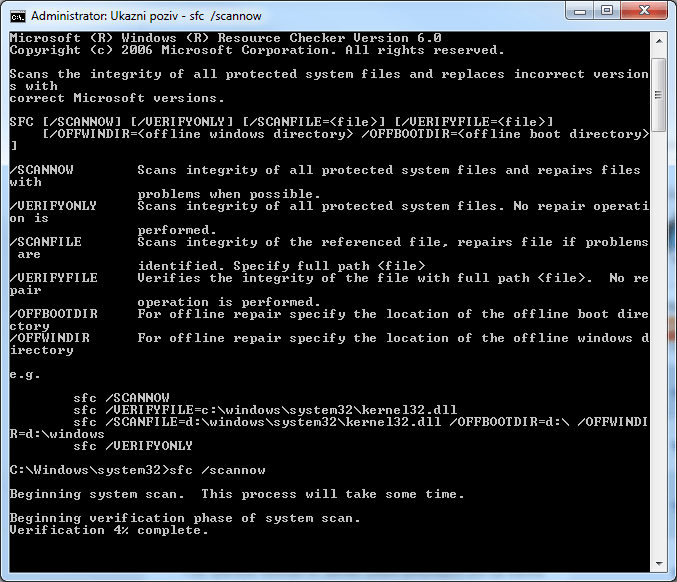 and starts to repair damaged / modified / deleted DLL files. If SFC finds problematic dll, then at first it looks for the latest version in backup folder of % SYSTEMROOT% \ system32 \ dllcache, or it looks for your Windows path and found it there. Most of the Windows installation is done via CD-ROM, so it is necessary to use the SFC tool to insert the Windows XP CD inside. Well, what if it is not at hand? In such a case is well prepared to have the i386 folder (copied from the CD), somewhere on the disk and correct installation path in the registry to point to this file. If the computers on the network, whether it be arranged that I edited myself; i386 folder is shared on the server, so no need to be on each computer separately. I use that solution at my job. In Start, Run, enter regedit, and that the registry will repair the Windows installation path that no longer point to a CD, on the computer or on shared folder in network. With the purchase of the computer we don’t get Windows installer CD but Retail Restore Disk. Just find this folder on the Restore CD and enter the path to this i386 folder. Despite editing of the registry, luckily it’s not necessary to restart the computer to force the change as its usual with modifying the registry. And most of all you can work with your computer while sfc tool is runing. With fixing corrupted dll files in Windows directory and after that use defrag tool you get fast Windows as they use to be on the new installed computer.